Thursday 21st June is Suffolk Day. To celebrate this, there will be an evening walk “Beating the Bounds”. Come and join us. Saturday 18th August is the date for the Village Fete. This year the theme will be “Celebrating the Centenary of the Royal Air Force”. A number of exciting attractions are being planned so, watch this space. Annual Litter Pick & Churchyard Clean up – Report. In spite of a pretty dreary and damp Sunday morning, there was a good turn-out to help with this year’s Litter Pick. 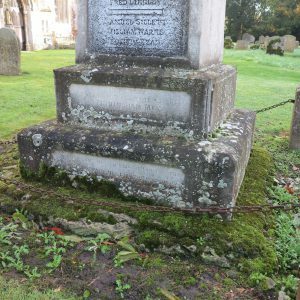 As we had received some observations (complaints) about the state of the Churchyard, the Council decided to include that with the litter-pick. Thanks to Erlin, we had a big skip into which all the Churchyard gatherings could be deposited, making a much neater result. All the roads in the village were covered, apart from a section of Walsham Road, which was so bad that there was not enough time to complete it. Just to prove that litter picking has its side benefits, a new plastic £10 note was found in a ditch along Gislingham Road, proving the durability of the new money! It was added to the Church collection box. Thank you all for your invaluable help. It is most unfortunate that the clean-up will only have a transient effect; the Cretins will be throwing their detritus out of their cars again very soon (you can count on it!). To end on a light-hearted note; a car stopped by one of our Pickers and the driver said, “I’m glad you are collecting litter, here is some more” and handed him a bagful! At least better than tossing it out the window. We shall be having another go later in the year so, please give us all the support you can. Many thanks to those who helped on this occasion. 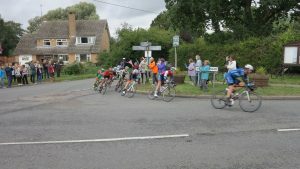 Just after midday on Friday 8th September excitment came to the village as riders in Stage 6 of the Tour of Britain Cycle Race came down the B1113 from Rob Hall Corner from Walsham le Willows and came into the village; turning left at the Pub Cross Roads on their way to Wickham Skeith. Stage 6 of the race was from Newmarket to Aldeburgh; 183 kms and won by Caleb Ewan (this is the third stage of the tour that he has won). The best spot to view was at the Pub Cross Roads where many villagers and visitors stood to wave on the competitors and the support vehicles. At one point, a runaway dog could have caused chaos as it ran alongside the riders but was quickly brought into line by an embarrassed owner! A couple of nights ago one of the Oak trees, which line the edge of the Green, lost one of its branches. 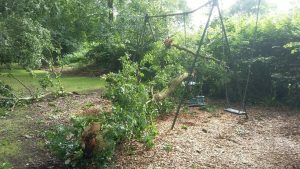 Unfortunately, the swings in our Children’s Recreation Area have been severely damaged and will probably be a write-off. The Parish Council are already underway with raising money to replace the slide, which recently succumbed to the ravages of time and had to be dismantled. This just puts the target further away! Following the news item below, things have been moving along a quite a pace. The Parsh Council have embarked on a loan arrangement with our neighbours, Gislingham, to share the speed monitoring “gun”, thus saving both the Parish Council and the Finningham Social Amenities Committee a considerable amount of money. Many thanks to Gislingham for their generosity. The Community Speed Watch Team, under the leadership of Andy Brownlie, are all trained and have already been out and about. From all reports, quite a number of motorists will be receiving letters from the Police. Let us hope that the Team’s efforts will have the desired effect. There are a number of potholes in and around the village and these have been reported th Suffolk Highways Department. As yet, nothing has happened (except that they are getting bigger!). Hopefully, something will be done in the near future before a cyclist hits one and comes off or a motorist damages his or her car. Thanks to the initiative of one of our residents, something is, at last, being done to combat the speeding which is endemic in our village. The crossroads by the White Horse pub has been the scene of many accidents over the years, a vast majority due to speeding. Fortunately, there has not been a fatality – yet. It could be only a matter of time. The Police do not have the resources to monitor the roads in our area so, the community is in the process of raising funds to invest in a speed camera. We realise that it is not possible to prosecute offending motorists but, hopefully, when it is up and running, it will have the desired effect and make them slow down. Other parts of the village are outside the 30mph zone and are bedevilled by motorists exercising their right to drive at the maximum (and often way above) 60mph, even though the roads are clearly not suitable for that speed. At one intersection, there have been seven accidents since last Christmas! All of them have been due to excessive speeds and poor road signs. Repeated representation has been made to the Suffolk Highways Department by the Parish Council and private individuals to introduce a lower speed limit but, as yet, little has been done. We are told that we do not meet the criteria required to warrant a lower speed limit. How many accidents do we need to meet those criteria?? 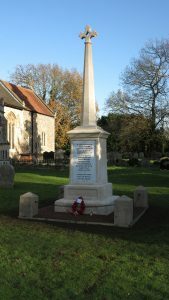 We have just been advised that the war memorial in our Churchyard has been Listed. This is particularly gratifying, as the Parish Council undertook to have it cleaned in time for the centenary of the beginning of World War l. This work was carried out by a local Stone Mason and funded by The War Memorials Trust. What a difference it has made – see for yourself! Detail of the Memorial before it was cleaned.